At the start, in businesses and other organizations, internal reporting was made manually and only periodically, as a by-product of the accounting system and with some additional statistics, and gave limited and delayed information on management performances. In their beginnings, business computers were used for the practical business of computing the payroll and keeping track of accounts payable and accounts receivable. As applications were developed that provided managers with information about sales, inventories, and other data that would help in managing the enterprise, the term “MIS” arose to describe these kinds of applications. Today, the term is used broadly in a number of contexts and includes (but is not limited to): decision support systems, resource and people management applications and database retrieval application. In this paper I will try to explain what Information Systems are, with a brief history of computers. This paper will not discuss the technologies, but will explain why organizations need information systems. Early computers – mainframes – were too large and expensive to have broad application in business and in the 1960s; they became cost-effective and widely adopted. Initially, the mainframe had a purely supporting role, mostly in the accounting department. This was the era of Electronic Data Processing (EDP). In the beginning of the 1980s IBM introduced the first Personal Computer (PC). Individuals used these machines in their home environment but soon they found their places in the offices and on the production floors. At first, the EDP professionals did not know how to cope with this event. Some simply ignored it and some began a war against these intruders. After a while, it became clear that the PC was there to stay. It took its place in the organization; first as a stand-alone workstation, but rapidly the need to act as a terminal for the mainframe arose. A few years later, departmental computers and Local Area Networks (LANs) technologies allowed people to share information and work together in small workgroups or companywide. The old EDP department only had one “client” within the organization but the newly born IT department suddenly had to cope with the whole organization. The users of traditional EDP were specialists in their branch and were therefore well trained to work with these systems; the newcomers only had a limited knowledge of computers. So, specialized services like training classes and help desks had to be organized by the IT department. Information Technology supported almost every part of the business and the dependency of it increased dramatically. As IT covered more areas of the business, it was more used to get a better insight in the business and became part daily activities in many organizations. Meanwhile, the communications technological evolution took place. People and their computers started to communicate and share information over networks and as few as three to four users – or as many as thousands – can access the same database or use the same computing resources concurrently within the organization or even between contents. Today’s organizations are confronted with rapidly changing market conditions, indicated by strong competitors. Under these conditions, traditional management approaches that focus on financial figures and on centralized planning methods are considered to be insufficient for steering the organization in a dynamical environment. Organizations all around the globe have to take the aid of information technology (IT) in some way or the other to keep themselves in sync with the market and the world. Different departments within organizations utilize IT to carry out their respective operations in a productive manner and efficient manner. Organizations need to buy software packages that would cater to their specific management, operational, and functional needs. For this purpose, they need to approach IT firms who deal in such software applications. Larger organizations on the other hand have their own operational and functional employees (IT staff) who develop software applications and work on several IT needs of the businesses. They usually purchase ERP software to coordinate different processes and functions into a single application, which is actually more convenient. How IT is utilized for this purpose? IT is used for storing, protecting, processing, securing, transmitting, receiving and retrieving information. In business establishments, information technology is used for solving mathematical and logical problems. Firstly, planning is done, data is collected, sorted and processed and finally, results are generated. An Information System is an organized combination of People, information technologies and associated procedures that store, retrieves, transform and distribute information in an organization to support operations, management, and decision-making. It is not the technology only but also to the way in which people interact with this technology in support of business processes. Information Systems are not necessarily computerized systems. Your book bag, the card catalog in library and the cash register in the restaurant are all example types of information systems. How Information Systems can help Business? Information systems often help business people determine that a problem exists and some action needs to be taken. For example, the inventory system at an organization flags items that need to be recorded, signaling to department managers that action is needed. Information systems show exactly what is currently happening and where we stand at this moment. 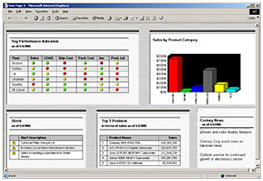 Typical system output is composed of a variety of reports that meet the needs of various employees for information about the company’s performance. For example, sales people can determine whether the company has a certain product in stock, or they can receive a report at any time during the day to see exactly how much of their quota has been completed to that point. Information Systems communicate company standards about what is supposed to be happening. Built into company reports is information about company standards. For example, indicators to flag performance that is outside the standard. Information systems facilitate communication among groups of business people who share responsibility for decision making. Information systems frequently provide such groups with a common body of information to be considered. Information systems reduce the amount of time that busy people must spend in face-to-face meetings. Computers can Calculate: Large amount of calculations and mathematical operations in a fraction of time. Computers can Store and Retrieve Data: Huge data (Text, numbers, images …) stored and retrieved from media in a very high speed. Computers can Communicate: Computers share data between each other and gives ability to people to share knowledge as well. Today’s organizations rely on computerized Information Systems for planning and controlling the performance of business processes and give managers the ability to utilize the collected data from daily and routine transactions to be analyzed and processed into useful understandable information which is then communicated to the various departments in an organization. Support for business processes and operations. Support for decision making by managers. Support for strategies for competitive advantage. There are two major types of the information systems; Operations Support and Management Support Systems. A business model is the method of doing business and represents core aspects of a business, including purpose, offerings, strategies, infrastructure, organizational structures, trading practices, and operational processes and policies. Management processes, the processes that govern the operation of a system. Operational processes, the processes that constitute the core business and create the primary value stream. Supporting processes, which support the core processes. A workflow is a description of a sequence of operations. Workflow may be seen as abstraction of real work, segregated for control purposes. With the business growth to be multi-functional / multi-location, organizations had to promote business effectiveness and efficiency with control while striving for innovation, flexibility, and integration with technology. That is what is called Business Process Management (BPM). BPM enables business to respond to changing consumer, market, and regulatory demands faster than competitors – creating competitive advantage. Some people view BPM as “the bridge between Information Technology (IT) and Business. The following Chart describes the major components of an information system supports a Business Process Management. Process Engine – a platform for modeling and executing process-based applications according to a workflow definition, including business rules. End user applications – which enable employees and operational staff to execute the process governed by the workflow rules. Content Management — provides a system for storing and securing electronic documents, images, and other files. Collaboration Tools — remove intra- and interdepartmental communication barriers through discussion forums, dynamic workspaces, and message boards. Business operations are recurring activities or day-to-day tasks involved in the running of a business for the purpose of producing value for the stakeholders. They consist of business processes. All businesses deal with production, inventory management, billing, etc. Each of these operations is a Business Process and is integrated and impacts one another. For example, if products are not produced and delivered, then billing cannot happen. An operations manager overall responsibility is to see that all operations run smoothly and he uses information systems to achieve this goal (to manage business processes and to integrate them). Routine Business Operations are managed by several types of information Systems such as the Transaction Processing Systems (TPS) which record and process the data resulting from business transactions, Process Control Systems (PCS) which monitor and control physical processes in manufacturing, and Collaboration Systems which enhance team and workgroup productivity. Decision making is an outcome of processes leading to the selection of a course of action among several alternatives. Every decision making process produces a final choice. The output can be an action or an opinion of choice. Intelligence: identify problems & opportunities, define objectives, criteria for success. 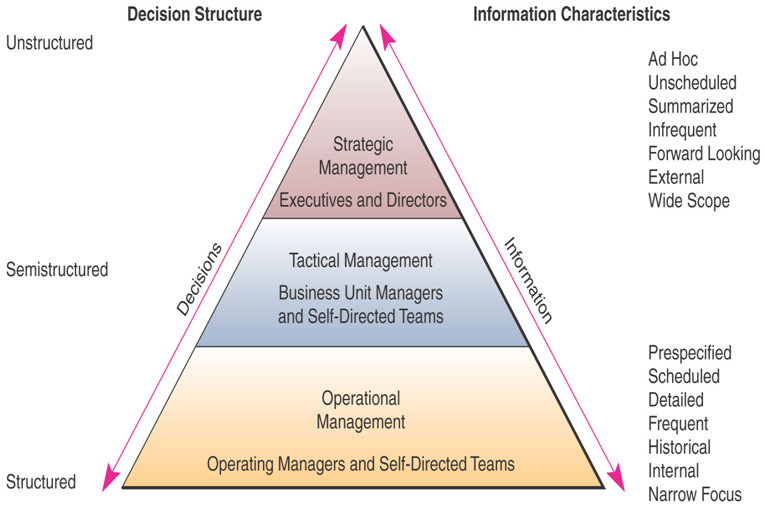 The type of information required by decision makers is directly related to the level of management and the amount of structure in the decision situations. Tools are needed to facilitate decision making processes. These tools can be classified as Decision Support Systems (DSS) which serve the management level of the organization and help to take decisions, which may be rapidly changing and not easily specified in advance. 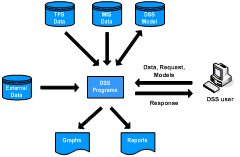 A DSS is an interactive software-based system intended to help decision makers compile useful information from a combination of raw data, documents, personal knowledge, or business models to identify and solve problems and make decisions. It helps avoiding a situation where you say ‘ if I knew that before I would have decide it differently ‘. DSS are integrated with other information systems through a common database. 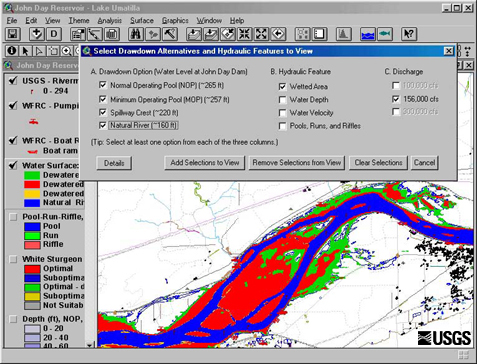 DSS characteristics include: Handling large amounts of data from different sources, providing report and presentation flexibility, offering both textual and graphical orientation and supporting drill down analysis. DSS also performs “What-if” analysis and simulation. The users themselves are also important components of the DSS architecture. Examples of DSSs include a bank loan officer verifying the credit of a loan applicant or an engineering firm that has bids on several projects and wants to know if they can be competitive with their costs. The Spreadsheet on your PC is also a Desktop DSS. DSS is extensively used in business and management. Executive dashboard and other business performance software allow faster decision making, identification of negative trends, and better allocation of business resources. A good DSS include high-level summary reports or charts and allow the user to drill down for more detailed information. A competitive advantage is an advantage over competitors gained by offering consumers greater value, either by means of lower prices or by providing greater benefits and service that justifies higher prices. There are some business strategies that could be adopted in order to gain competitive advantage and relate to the business activities and to which a business seeks to differentiate its products. Becoming a low-cost producer and services in the industry and finding ways to help suppliers or customers reduce their costs or increase the cost of competitors. Differentiate the company’s products and services from its competitors by developing new IT features and use them to reduce the differentiation advantages of competitors. Expand the company’s capacity to produce goods and providing services, Expanding into global markets, and integrating into related products. Use IT to manage regional and global business expansion. Create new products and services that include IT components. Make changes to business processes with IT that dramatically cut costs. Improve quality, efficiency of customer service using automated IT solutions. Use IT to create virtual organizations of business partners. Develop inter-enterprise information systems linked by Internet and extranet that support strategic relationships with customers, suppliers and others. In business, information systems are used through the Value Chain of activities which in turn enable the organization to optimize and control function of operations. They create a linkage between these activities through a value chain and help in lowering cost of value activities or by product’s differentiation. The Value Chain of activities (Michael Porter) showed here are either primary processes or supporting processes with examples. Primary processes directly related to manufacturing or delivering products where Support processes help support the day-to-day running of the firm and indirectly contribute to products or services. 4 Conclusion Executives are making critical business decisions every day based on the information available to them. This information can come from a variety of sources: opinions from peers and colleagues; a personal sense of intuition or business judgment; or data derived internally or externally to the organization. Standards, compliance, and risk reduction. Providing analysis and reporting tools to create a centralized view necessary to ensure that departmental activities are in line with the overall corporate strategy. Providing real-time information, allowing management to track performance and make adjustments more rapidly. Combining value chain data it is possible for management to make better-informed decisions in deploying the right people, investments, equipment, and assets for the right activities at the right time. provide firms with a strategic advantage. David Kroenke / Richard Hatch, Fifth Edition. Which to use, CAT5 or CAT6 LAN cables?